NOTE: A combination of late night podcasting and the fact that I'll be out of town starting tomorrow led to a shorter than usual write-up. Sorry. Last season, "Britney/Brittany" made me a little gun shy about Glee's tribute episodes. Since so much time was spent on stringing together remakes of Brit's most famous music videos, and so little time was spent on actual story, I was afraid that "Michael" would fall into a similar pattern. While this one wasn't the most stellar in regards to plot, I did find myself liking it more than the aforementioned Spears lovefest. Like always, Ryan Murphy tried to tell way too many "stories" in a small amount of time while also trying to find space for nine Michael Jackson songs. Much like "Britney," most of the plot lines felt like ways to connect various musical performances, but they were stronger this time around. Making the Warblers the new Vocal Adrenaline was inspired, and Sebastian makes a more believable villain than Sue or Santana at this point. Hopefully, they'll focus on making him the bad guy and let the other two resemble human beings. The bigger story though revolved around Finn and Rachel since she still hadn't given him an answer to his marriage proposal while she eagerly awaited her letter from NYADA. The drama was amped up by the fact that she had to watch Quinn and Kurt get their acceptance letters which freaked her out so much that she said yes. Cue the tardy parcel from NYC that told her that she too was a finalist for NYADA, but what how will that affect Finn? I know that Rachel's answer could be potentially divisive, but the way I see it is just because she said yes doesn't mean they're getting married, so people need to calm down. Now, if they do go through with it, that could be the final straw for me. Other stories that floated in and out of the MJ montage included Artie blowing up at Mr. Schue for not fighting back, Quinn's acceptance to Yale, and an eye patch that was there to explain why Blaine was on Broadway for two weeks. Oh, and a sweet Samcedes moment that really didn't qualify as an actual story per se. These were inoffensive and entertaining, but that's about it. I was glad to see Artie man up though which made him less annoying. On the Music Front: Way too many songs to go through, but I did like "Never Can Say Goodbye," "Human Nature," but the cello dueling version of "Smooth Criminal" was by far the best number of the night. I really didn't care for "Bad" or "Ben," and "Black and White" was a little on the nose, but oh well. 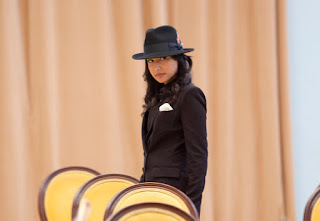 Much like Sue, Santana's at her best when she's a combination of good and bad. For some reason people felt that Quinn getting into Yale was impossible. She's a straight A student with some decent extracurricular while being knocked up ... how is that not Ivy League material? Usually, I don't point this out but where was Tina, Rory and Sugar? Maybe if they had cut out "Ben," they would have had time to give them something to do. "World's Greatest Dad:" Burt Hummel or John Casey. Discuss. Quotes to be added later. Honestly, "Michael" was better than it had any right to be. I enjoyed the musical numbers for the most part, and the so-called plot points worked despite not being the most in depth or interconnected, but at least they kinda made sense. Overall, "Michael" was not at the level of "The Power of Madonna," but it was substantially better than Glee's other attempts at homages. << Next Episode: "The Spanish Teacher"